Teeing it up higher is one way to get the ball up in the air. As you develop your golf game, you will find that it is possible to hit both high shots and low shots down the fairway and get good results from both. However, over the long term, the golfer who can hit the ball high has a better chance to improve his score. Hitting a ball high will get you more distance and it will help you get the ball over and past hazards. Tee your ball up high for your driver shots. The standard golf tee is 2 1/8 inches long. Use a longer tee -- 2 3/4 or 3 1/4 inches -- to tee the ball a bit higher. Change your ball position. For the tee shots, stand so the ball is in line with the inside of your left heel (for a right-handed golfer). 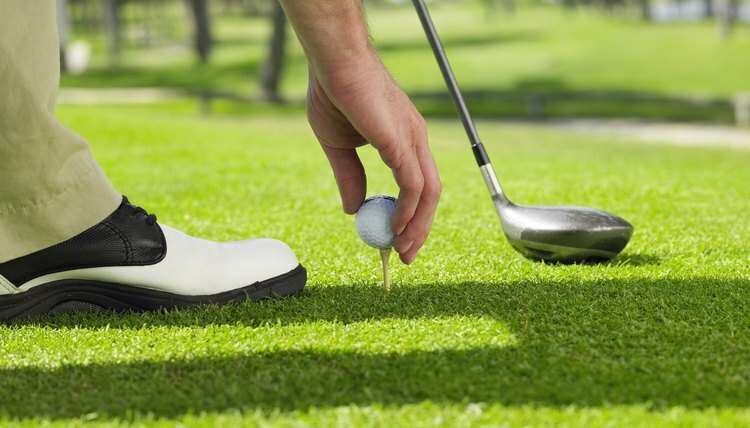 For shots off the turf, play the ball an inch farther forward (toward the target) than you typically would. Hit the ball at the bottom of your swing, rather than on the way up. The downward motion creates the backspin that lofts the ball in the air. The exception is the tee shot, which you hit on the upswing. Get clubs with a more flexible shaft and/or a higher bend, or "kick," point. Buy a driver with more loft -- at least 10.5 degrees. Even better are drivers with 12 to 15 degrees of loft.